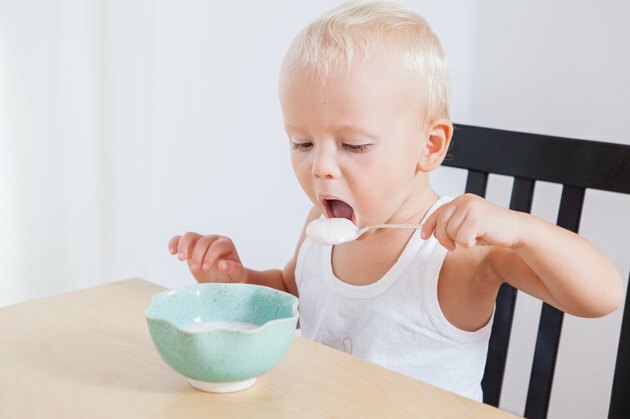 Toddlers are notoriously picky eaters, but the situation can become even worse when children are cutting their molars and chewing becomes painful. Fortunately, your child can still eat a variety of healthy foods, including many of her favorites; you just need to find new ways to prepare and serve them so they're soft enough to require little or no chewing. Yogurt isn't just soft and smooth -- it's cold -- which can help ease the discomfort of erupting molars. Make your child's yogurt even healthier by purchasing a plain variety with no added sugar and mixing it with fresh or frozen fruit in the blender until smooth and uniform. Applesauce is another cold food that goes down with no chewing, but has enough fiber and vitamins to make it a healthy snack or side dish. Other fruit and vegetable purees are equally appropriate for teething toddlers, but applesauce is sold in large containers, so you won't have to spend money on costly jars of baby food. Pasta is a dietary staple for most toddlers, and you can make this a teething-friendly food by selecting bite-size pasta such as mini shells, wheels or orzo, and cooking it for a few minutes longer than usual; you'll have noodles that are small and soft enough to require just the smallest amount of chewing. Try tossing the pasta with butter and Parmesan cheese or smooth tomato sauce. Crunchy fruits such as apples might be too tough on a teething toddler, but soft fruits such as watermelon and overripe bananas require little in the way of chewing and provide plenty of nutrients in just a few bites. Just be sure to cut all fruit into small pieces to prevent choking and minimize the amount of chewing necessary. Cheese is another toddler-friendly favorite, and it's easy to present to your child in a way that won't hurt his teeth. Cottage cheese can be eaten off a spoon and swallowed with no teeth involved, or you can serve your toddler shredded cheddar or mozzarella, which are small and soft enough that they don't require him to use his molars. Eggs are packed with vitamins and deliver a healthy dose of protein, which is important when your teething toddler is refusing meat and other sources of protein. Scrambled eggs require little chewing, and you can make them even softer and fluffier by adding a tablespoon of water and a sprinkle of cheese to the beaten eggs before cooking. When your baby was first learning to eat solid foods, you probably fed her well-cooked vegetables, and those same foods are great for toddlers who are having a hard time chewing without pain. Cook carrots, green beans and potatoes until very soft, then cut them into small pieces before serving to your toddler. What Can I Eat With No Teeth?